Paul Sellew, founder and CEO of Little Leaf Farms, checked lettuce at the Devens facility. 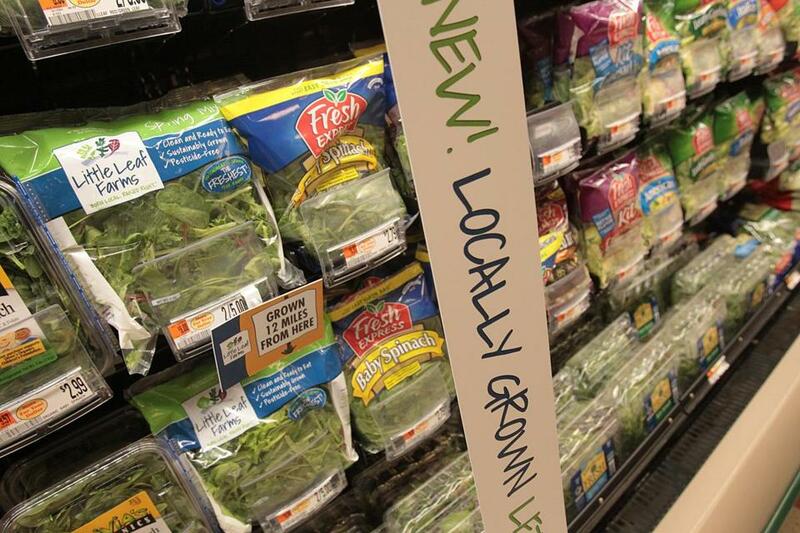 In the produce section at the Littleton Market Basket, tucked between the rows of Olivia’s Organics and Fresh Express, is a newcomer to the packaged salad shelves: Little Leaf Farms baby lettuce mixes. Unless a supermarket has a garden in its backyard, locally grown doesn’t get much closer. Little Leaf Farms, just 12 miles away, is a three-acre greenhouse with a north-pitched roof that captures rainwater, stored in a two-million-gallon basin. After the water is disinfected with UV light, it is used to irrigate the plants. “There’s no red barn on the hillside, but this is a farm, and our job is to keep the plants healthy, use technology to get rid of the grunt work,” said founder and CEO Paul Sellew. This is a farm where Mother Nature gets a high-tech boost: Pelleted seeds are planted in soilless trays and nourished with a mixture of water and nutrients: nitrogen, phosphorus, potassium, and micronutrients, a precise application of everything a plant needs to grow. And after 25 days — the time it takes to reach full growth — the greens are carried by conveyor belt from the tropical air of the greenhouse into cooler cutting and mixing rooms, continuing their journey along an automated assembly line to be bagged by machine and packed into boxes that are refrigerated and shipped out the next day. “I’m a huge believer that we have to live in a more sustainable way,” said Sellew, ticking off a list of ways that he is reducing and reusing natural resources. His process eliminates pesticide residue and avoids the need to throw out the 50 percent of produce that doesn’t survive the seven-day truck ride from fields in California or Arizona. This isn’t Sellew’s first venture into sustainable agriculture. After graduating from Cornell in 1980 with a degree in horticulture, the six-foot-eight Sellew played professional basketball in Europe and South America for three years, and in 1983, started Earthgro, a composting business he sold to Scotts in 1998 for $47 million. Over the next 15 years, Sellew founded and ran six more companies, including Backyard Farms, a hydroponic tomato greenhouse on 42 acres in Madison, Maine, now one of the largest greenhouse tomato growers on the East Coast, and Waltham-based Harvest Power, where he is still a shareholder, which converts food and yard waste to energy, compost, and organic fertilizer. Annual revenue for Harvest Power is about $150 million. 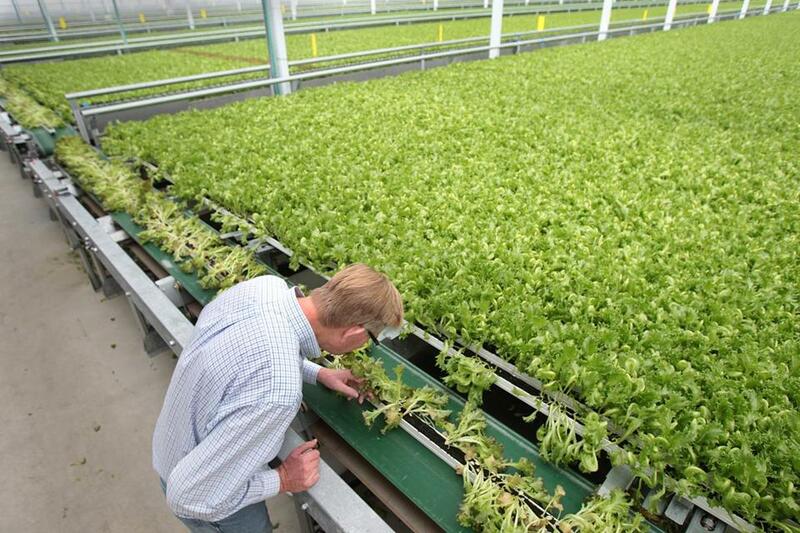 He started Little Leaf Farms in Devens on 14 acres purchased from MassDevelopment with $4.5 million in financing from the state agency and his own money and began delivering the packaged salad greens to supermarkets across the state and region in mid-July. The business has 10 employees, including its CEO, who anticipates adding jobs as the business grows. Sellew grew up on Prides Corner Farms in Lebanon, Conn., which was started by his late father, Peter, and is still family-run by his brother Mark. 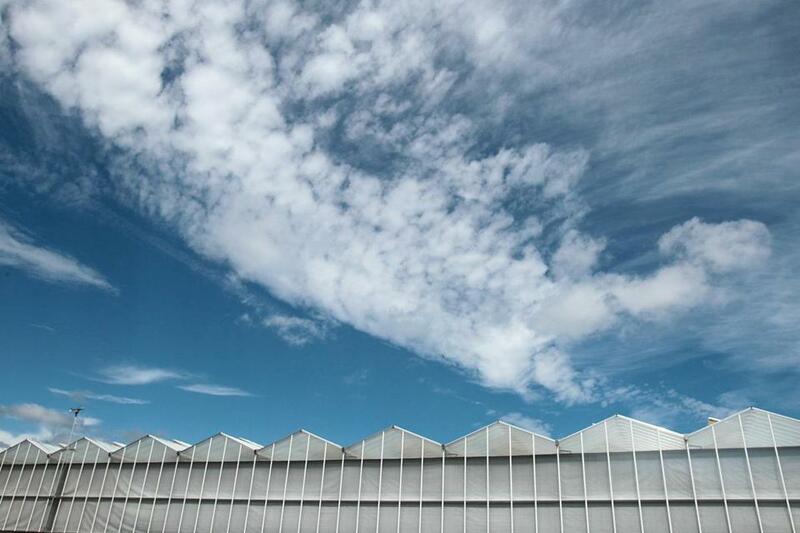 The farm’s 3-acre greenhouse, with a north-pitched roof, captures rainwater for storage in a two-million-gallon basin. The self-described “New England farm boy” works out of an unadorned room that he shares with his executive vice president of sales, Tim Cunniff, who cut his teeth in produce as a pineapple salesman for Dole; head grower Pieter Slaman, a fourth-generation Dutch lettuce grower; and assistant grower Tanya Merrill, who graduated from Cornell last year with a degree in horticulture. It was Sellew’s track record that persuaded Roy Angel, loan officer for MassDevelopment, to approve the $4.5 million financing for Sellew’s seventh start-up. Angel says the agricultural business complements the burgeoning business and industry hub at the former military base in Devens, a focus of the state’s finance and development agency. For years, the Dutch have been growing lettuce and other vegetables inside hydroponic greenhouses, taking advantage of sunlight and rainwater to compensate for the limitations of geography: too far north of the equator, with land at low sea level. By contrast, Americans have taken for granted a seemingly endless supply of natural resources — land, water, fossil fuel — that now, in the wake of droughts, freezes, and other changes wrought by climate change, are giving farmers pause. So although hydroponic farming methods have been available in the United States for more than 30 years, they have only recently begun to catch on. “It’s taken off now because the market finally caught up with the technology,” said Gene Giacomelli, a professor of agriculture and biosystems engineering at the University of Arizona who helped design the food growth chamber, a hydroponic growing system at the US research station at the South Pole. According to the most recent USDA census of agriculture, there were 1,404 acres worth of greenhouses in the country in 2007. By 2012 that had increased to 2,227, with 3,534 projected by 2017. At the same time, consumer demand for packaged salads is growing. A report by the Produce Marketing Association, a national trade group, says that packaged salads were the top seller among 10 produce categories in a 2015 survey. Head lettuce ranked eighth. Little Leaf Farms lettuce for sale at the Market Basket in Littleton.